I was probably somewhere between eleven and thirteen years old. The barn situated on our small farm was about 75 feet from the stock pond. It was a hot and dusty summer, and we were keeping some hogs in the side shed of the barn. 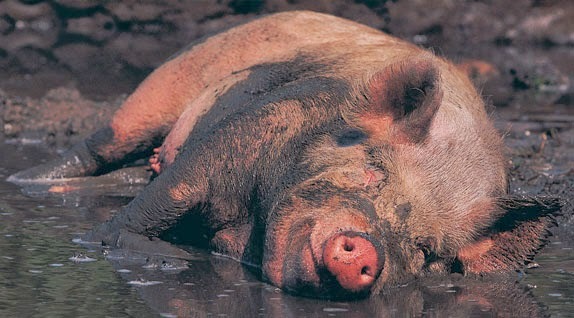 Knowing how pigs love to wallow in the mud, I decided to bring water from the pond and provide a mud hole for the pigs. I got a 5 gallon bucket and proceeded to tote water. The pigs responded with grunts and squeals of delight as they rooted around in and wallowed in the mud. I remember it took lots of water to make a nice, big, loblolly. It was a lot of hot work for this skinny little kid, but when I reached a stopping point, I perched right there on top of those old rough fence boards and thoroughly enjoyed watching those pigs enjoy their mud hole. Years later, as a father of four, I thoroughly enjoyed watching my children enjoy things in which they delighted. Today, I enjoy seeing grandkids laugh and play as they enjoy the swings and other good things that are provided for them. Jesus said if you, as an “evil” or “natural” parent enjoy seeing your kids partake of and enjoy good things that you provide them, in the same manner the heavenly Father enjoys seeing his kids enjoy good things from his hand. Jesus affirmed that the Father won’t give you anything bad, and if you will ask, seek, and knock, he will give you the Holy Spirit to assist you in your daily walk through this life with his supernatural gifts and power (Luke 11:9-13). In another place Jesus said it was the Father’s good pleasure to give you the kingdom (Luke 12:32). Our heavenly Father enjoys seeing us prosper and be in health even as our soul prospers (3 John 2). Satan, has come to steal, kill, and destroy, Jesus has come to give life and life more abundant (John 10:10). Any mentality that might beset us that says God lays hard things and bad things on us to teach us a lesson doesn’t fit. Yes, he will be with us when the hard and bad comes, and we can learn good lessons from bad things in life, but we can know of a certainty that God is always for us and not against us. God has good things for us, not bad things. Your summer might be hot and dusty and your spiritual ground is parched and dry. 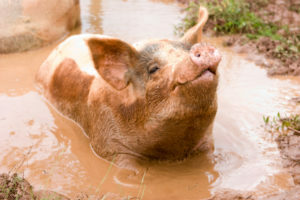 Remember that if you ask, seek, and knock, God will thoroughly enjoy pouring out for you a blessing of living water through the Holy Spirit in which you can wallow and be as happy as a pig in mud.